A nonprofit governance model that provides a significant amount of trust between board and staff can lead to an entirely new working environment. It calls for a working relationship based on respect for all involved, especially respect for management personnel by the board. This is in short supply in many nonprofit environments. All communications go through the CEO. He or she is the person accountable to the board and acts as the “staff representative” in the board-staff relationship. As a result, the assessment of the CEO must be fair and thorough. The board needs to, “trust but verify”, as advised by President Regan. The assessment process is especially crucial for nonprofits because the nonprofit goals are often highly qualitative, and the profit motive is absent, although meeting budget constraints in today’s environment is daunting. These process changes generate a new kind of culture. Where allowed by state law, the president/CEO should be a voting member of the board, as a tangible symbol of the partnership between board and staff. But some directors see this change as placing the chief executive in conflict with his or her management responsibilities. Others see the arrangement as making the president/CEO a board peer, not a powerhouse. A trusting nonprofit governance model, with its channel of communications through the CEO is a more formal model. But this is a natural outcome for any growing organization, whether it is a for-profit or nonprofit one. Events, such as celebrations of program successes, need to be held to ensure that there is some interpersonal contact between board and contact. In the nonprofit arena, board chairs can change very quickly, every year or two. 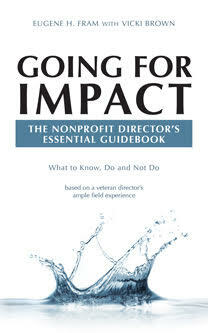 Consequently, the nonprofit staff members are probably more attuned to board movements than their counterparts in the for-profit world.